ONCHAN, Isle of Man – May 1, 2018 – The Stars Group, through its flagship PokerStars, BetStars and PokerStars Casino brands, today announced the biggest prize in online sports betting with the launch of the Stars £100 Million Challenge, putting just 64 correct selections in the way of winning a life-changing prize of £100 million during this summer’s football World Cup. Straightforward and free to enter, this unique contest is open to adults in the U.K, Sweden, Denmark, Norway and Finland, who must correctly select all 64 results (simply as a win, lose or draw prediction) from this summer’s spectacular football tournament. If all are correctly selected, the winner will take home the lump-sum £100 million bounty. If more than one person wins, the prize will be shared equally. Each eligible player has one free entry. However, players can gain additional entries by completing challenges at the PokerStars, BetStars and PokerStars Casino gaming sites, where millions of Stars customers play for winning moments. In addition to this historic top prize every entrant - whether on web, mobile or desktop - will be entered onto the Leaderboard Challenge where there are 1,000 prizes up for grabs. With points awarded for correct predictions, entrants can track their progress against friends, relatives and neighbours, with the top 1,000 entrants awarded a selection of prizes from $10,000 in cash and a $30,000 PokerStars Players No-Limit Hold’em Championship (PSPC) Platinum Pass to PokerStars Spin & Go tickets, BetStars free bets and PokerStars Casino bonus spins. The PSPC is one of the most anticipated events in poker and takes place in the Bahamas in January 2019. “When we decided to launch the biggest betting promotion in history, we thought about hiring the biggest star in the world to be the face of the Stars £100 Million Challenge... but there isn’t a star that’s big enough so we got Freddie Flintoff,” joked Christopher Coyne, Chief Marketing Officer of Stars Interactive Group. “Freddie wanted to be part of the promotion and when we said yes he was over the moon. That led to the campaign creative of shooting him into space." The Stars £100 Million Challenge will also introduce The Stars Group’s first multi-brand ambassador, former cricket star and popular TV presenter, Freddie Flintoff. Flintoff, who is a keen sports and poker fan, will represent the brands across poker, sports and casino. Danish comedian and TV star Casper Christensen and Swedish celebrity chef Per Morberg will also be featured in the campaign across the Nordic regions. The Stars £100 Million Challenge launches with a build-up TV and digital campaign, which showcases the celebrities’ efforts to be the star of the show and can be viewed at PokerStars Blog. Partnering up with Crispin Porter + Bogusky London, the campaign marks a fresh creative approach under Stars Interactive Group’s recently named CMO Christopher Coyne. 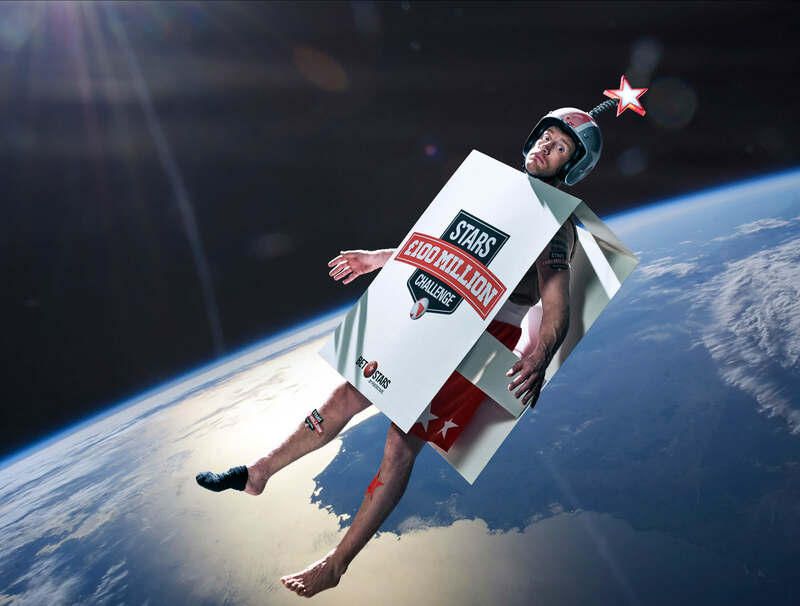 The ads see the bemused trio of Flintoff, Christensen and Morberg constantly reminded they’re merely there as billboards, even to the point of being launched into space, half-naked (sorry, Freddie, hope you find your lucky sock!). “You see Freddie, the prize is the star, not you,” explains the voiceover. In a follow-up spot, we see the cricketing legend unceremoniously dangled in front of a CGI green screen, his head the only part of his body in view. “I better not just be the dot on the i!” he grumbles. The first-ever multi-brand campaign run by The Stars Group also offers plenty of action to those outside the UK and Nordics. Heading full throttle into football’s biggest tournament of the year, BetStars, PokerStars and PokerStars Casino is planning a summer filled with special promotions, giveaways, new products, entertainment, and plenty of hijinks and fun yet to be shared. Fever has spread with BetStars offering Best Prices, Odds Boost, and many special promotions. PokerStars Casino continues to offer some of the biggest jackpots in the industry, while also introducing new games and themed celebrations. And to go alongside its guarantee-smashing, record-breaking, best-in-business poker offering, PokerStars will run special $1 million Spin & Goal tournaments, which offer themed Spin & Go million-dollar action and come enhanced with BetStars prizes - perfect bite-size poker action for half-time entertainment. Through the Stars Rewards loyalty program, customers on PokerStars, BetStars and PokerStars Casino are rewarded for their play across all sites with challenges, randomised prizes and free bets based upon their individual playing profiles. Since launching last year, Stars Rewards has awarded customers more than $100 million in prizes. Stars Rewards is adding more than $4 million in extra prizes leading up to and during the football World Cup via new Football Frenzy and Flaghunt promotions. During Football Frenzy, which will run ahead of the start of the tournament, special football chests can be won which can only be opened when the football action begins. That’s when Flaghunt kicks off, with country flags stuffed in every Stars Rewards Chest throughout the duration of the tournament. When players fill their Flaghunt grid, they claim the cash in their Chest. There are 100 million reasons why PokerStars, BetStars and PokerStars Casino are the places to be this summer, and many ways to get involved. Taking part is pretty straightforward, whether you’re at home or watching from your local pub and cheering your team on. The total amount of £100million will be made in one payment to any customer (or shared between joint-winners) if 64 correct match results (win, lose or draw) are predicted. All participants have one free entry, but can acquire additional entries by completing one or more different challenges across The Stars Group’s brands. The Stars £100 Million Challenge is available in the United Kingdom, Denmark, Norway, Finland and Sweden. Prediction selections must be made before 23:59 (UK time) on June 13, ahead of the opening match between Russia and Saudi Arabia.